All transactions are safe and secure with a reliable history in online purchasing behind each of our associates. 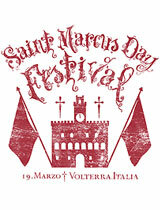 Buy the New Moon Saint Marcus Day Festival t-shirt to own New Moon clothing and merchandise. Most people can cope with the loss of a loved one but not Edward Cullen. After being misinformed that Bella has jumped to her death, Edward decides that death is his only option. He flees to Italy to provoke the Volturi into killing him, but Alice and Bella understand the mistake and rescue him before it is too late. This Volturi t-shirt is a reminder of their heroic actions in the New Moon movie and book against the Volturi coven members, including Jane (Dakota Fanning), Caius, Marcus, Aro and Alec. In addition to the New Moon Saint Marcus Day Festival tee above, browse the New Moon Clothing Gallery for more apparel like men's and women's clothes, kids shirts or hoodies.